The Portuguese entourage has arrived to Polish lands this Monday night, but just before the trip, the entire team was present in a protocol ceremony with Cavaco Silva, the President of the Portuguese Republic. Cristiano Ronaldo addressed a few words during the event and reassured everyone that every player will be giving their best when representing the country in the EURO 2012. 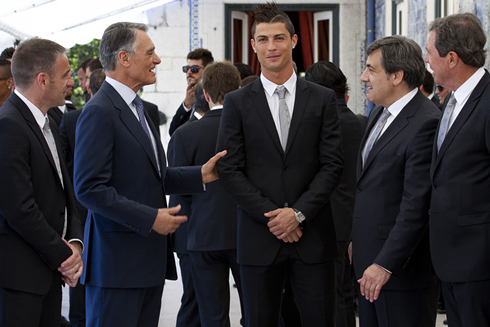 On the day the Portuguese National Team travelled to Opalenica (Poland), in order to start preparing their EURO 2012 debut against Germany next Saturday, Cristiano Ronaldo and his teammates were received by the Portuguese President, Cavaco Silva, in the mytical "Belém Palace". Ronaldo promised full commitment and dedication during the entire tournament and said that the Portuguese team is highly focused in dignifying the country in the EURO 2012. Cavaco Silva was keen to show his confidence on the 23 men chosen by Paulo Bento and said that the Portuguese nation has a tradition of rising to the occasion when going through difficult times. The first person to talk was precisely the Portuguese President, Cavaco Silva, who clearly tried to pass a positive message to the Portuguese delegation that was present at the ceremony. Cavaco Silva: "The Portuguese people believe that this team is up to the challenge and therefore, they trust and hold a lot of hopes in you. I have no doubts that everyone will give their best to honor the country's name. It's especially in difficult moments like these that the Portuguese people rise to the occasion and I'm confident that the same will happen with this team", started by stating the President of the Portuguese Republic. Cavaco Silva: "Success is obtained after a lot of work, dedication, courage and dignity. In Portugal, everyone will try to transmit something positive to the team, just like I'm sure it will happen with all the Portuguese citizens spread all around the World, as we will all be following the games with great enthusiasm", said Cavaco Silva to conclude his speech. The Portuguese captain and Real Madrid star, Cristiano Ronaldo, also stepped up to leave a few words in behalf of the team, and expressed his will and desire of making the nation proud of their performances and attitude on the pitch, throughout the entire EURO 2012 tournament. Cristiano Ronaldo: "This team is fully committed and extremely focused to make a good job in the EURO 2012. We are going to be ready to the challenge", remarked the 27-years old player. 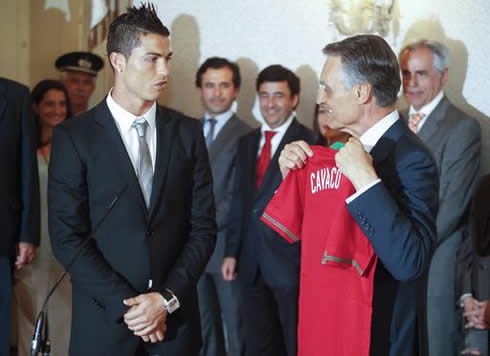 On that same moment, Ronaldo handed a Portuguese National Team jersey to Cavaco Silva and invited the President to go watch one of the tournament games. 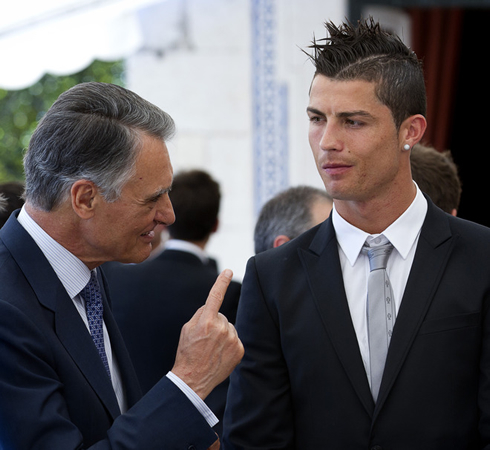 On a different note regarding this ceremony, a few days ago Cristiano Ronaldo has also spoken in a Portuguese TV show from SIC, called "Alta Definição", which is scheduled to air next Friday (precisely the day before the debut in the EURO 2012 against Germany). Earlier today though, some parts of this interview came to public and we can all witness how the Real Madrid forward doesn't hide his confidence on the Portuguese teammates. Cristiano Ronaldo: "This team has the potential to win something big and I'm confident that what we've been lacking lately, will be there for the EURO 2012. As for predictions, I'll just quote what that other guy said a while ago... predictions only at the end of the game! [laughs] We'll give our best and we'll run from the first to the last minute of each game. Hopefully, things will go our way! ", promised the Portuguese captain. Cristiano Ronaldo: "I want to be one of many players to help defending the colors of this country. Someone who always gives everything on the pitch and fight from the start to the end. Being the team's captain is a big pride and it's certainly a peak in any football player's career", confessed the Portuguese player when replying to a question concerning what he feels when he wears the Portuguese National Team armband. The 27-years old still talked about his first steps on the Portuguese squad, back in 2004, when the team reached the EURO 2004 final, in a game where they lost to Greece by 0-1. Cristiano Ronaldo: "I'm almost like an old carcass these days [laughs]. Life goes by very fast and it has been almost 10 years since my debut! However, I still feel useful and privileged for playing alongside with such great footballers", said CR7, just before leaving an advice on how the Portuguese people should look at life, in order to overcome the current financial crisis. Ronaldo: "We can't keep regretting forever. We have to be optimistic, as well as positive and just go out there and fight. One day, things will go our way and everything will change", pointed out Cristiano Ronaldo. The TV show [Alta Definição] will be on air this Friday, in the Portuguese network station, SIC. Real Madrid will be back in action next July, by the time the pre-season starts over. In the meanwhile, Cristiano Ronaldo's next game will be for Portugal for the EURO 2012, against Germany. You can watch Juventus live stream, Portugal vs Germany, Poland vs Greece, Netherlands vs Denmark and Russia vs Czech Republic, all from our football live streams section. Cristiano Ronaldo will most likely be on the line-up, when Portugal faces Germany in Poland, this Saturday night.